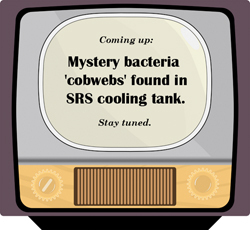 Mystery bacteria ‘cobwebs’ found in SRS cooling tank | Aiken Standard – microBEnet: the microbiology of the Built Environment network. Everyone likes a good mystery story. Particularly when it involves some unknown kind of bacteria growing underwater on spent nuclear fuel rods with no obvious carbon source for growth. Stay tuned.